Education beyond high school is the key to a healthier and more prosperous future — not only for students and their families, but for our entire state. That’s why we believe that no Washington student should be prevented from pursuing higher education due to financial barriers. 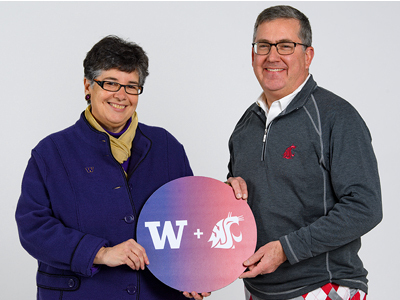 We may compete on the field, but the University of Washington and Washington State University are united in our mission to help students from all backgrounds attend college, graduate and go on to do great things. That’s why we’ve partnered to spread the word about scholarships and financial aid available for students at colleges and universities across the state. Every family’s situation is different, and every student has different goals and passions — so we encourage you to explore Washington’s universities and colleges to find the best fit for your student. Together, we can ensure that higher education is more than a dream for Washington students. Let’s make it a reality for every one of them.